The city of Southfield will launch a new community engagement Web site, Sustainable Southfield, on January 22 where citizens can connect, communicate and collaborate with community decision makers and other residents about the future Southfield from the comfort of their home. 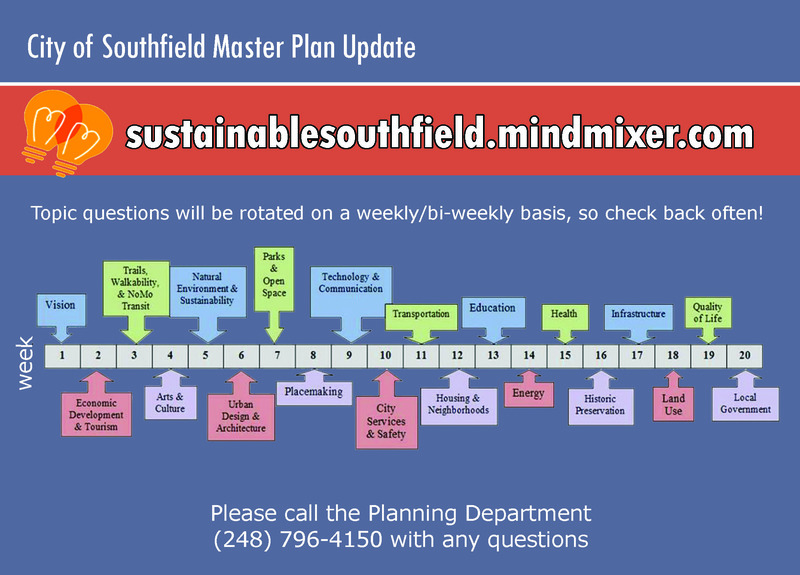 To join in the discussion, simply logon to sustainablesouthfield.mindmixer.com, create your account and begin participating. 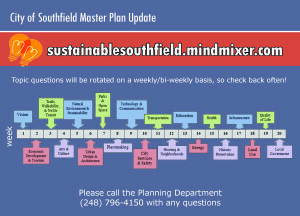 In 2014, the City Council authorized the City Planner to update the Southfield Comprehensive Master Plan (last Adopted April 2009) in accordance with state law. One goal of the Master Plan is to reposition the city of Southfield to be a vibrant place to work, play and live to meet changing demographic, housing and economic shifts in the near and distant future. Sustainable Southfield is a comprehensive master plan that will establish a holistic guide for the City’s future land use as well as balancing the City’s social, environmental and economic needs for now and the future. The goal of the new Web site is to get the community involved in the planning process. 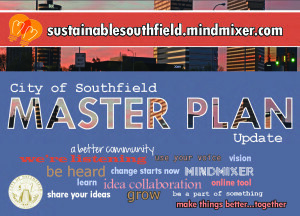 Along the way, Sustainable Southfield, will be used as an online tool to generate new ideas and feedback from citizens using this interactive and accessible platform. Feedback from the Web site will be used by the city of Southfield to develop plans on a variety of projects, particularly the City’s updated Master Plan. 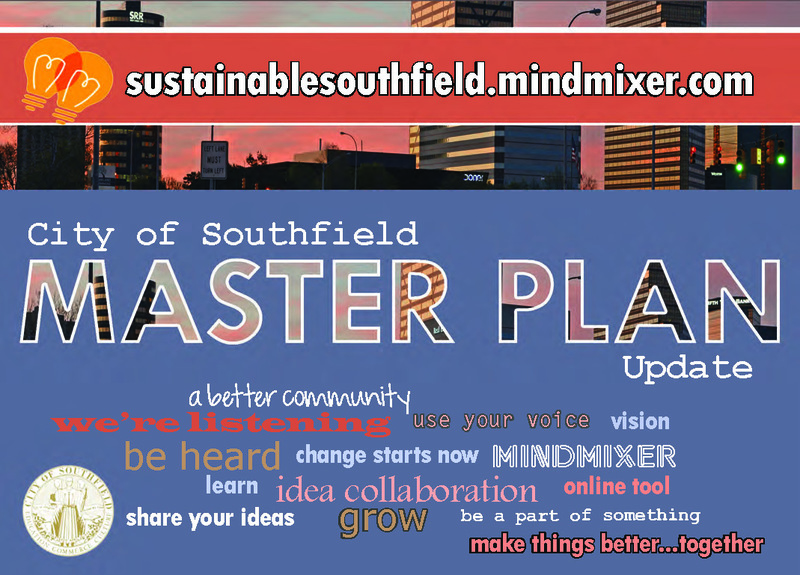 Sustainable Southfield gives contributors a chance to share new ideas, support others’ ideas, expand upon existing ideas and give feedback on initiatives, working with community leaders on a variety of topics online anytime, anywhere. The site also measures and tracks participation, identifying the most interested citizens and most compelling topics. MindMixer’s tools make it easy for administrations to communicate back with citizens, and they deliver measurable results and invaluable insights for the planning process. As part of its service, MindMixer consults and collaborates with clients to identify issues that are critical to stakeholders in order to update topics and content for their Web sites. For more information, call the Southfield Planning Department at (248) 796-4150 or visit www.cityofsouthfield.com. We believe that people care about their communities, so we make it easier to play a part in making them better. Our best-in-class engagement technology has helped hundreds of organizations build stronger relationships between civic places and the people who love them through transparent, meaningful and productive interactions. Since 2010, MindMixer clients and participants have generated hundreds of thousands of great ideas for creating better communities. Find us on Twitter and Facebook.